Nepal Foreign Affairs (KATHMANDU, 30 August 2018) – President Bidya Devi Bhandari has said that the member states of the BIMSTEC should focus on progression that gives quality, clear and direct impact on the life of the people though common efforts. Addressing heads of state and government of the Bay of Bengal Multi-sectoral Initiative for Technical and Economic Cooperation (BIMSTEC) member states here today, she expressed the confidence that the summit would be successful in further promoting mutual friendship, unity, understanding and mutual cooperation. 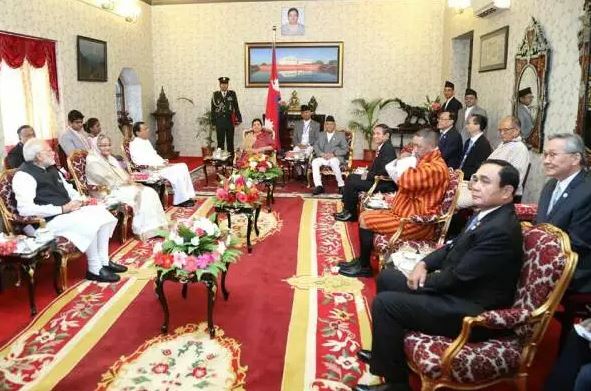 The arrival of heads of state/governments of BIMSTEC countries have excited and dignified Nepali people, she said, adding, “BIMSTEC has been established as a shared identity of all of us. It is a source of historical, social and cultural identity and civilization”. With the passage of two decades long journey, the BIMSTEC countries have witnessed enhanced level of mutual cooperation and collaboration. “There are high expectations from the people of Nepal towards BIMSTEC. Our people have started cherishing a sweet dream of prosperity under the shared roof of BIMSTEC”. In order to materialize the dream, the member states should take strides by further enhancing cordial unity, collaboration and mutual cooperation, she added. The Head of the State urged the member states to prepare a clear action plan to forward the projects of trade, investment, energy, tourism after properly utilizing the resources of the respective countries. She also opined for connecting the region through air, water and land routes along with the information technology. She focused on eradicating poverty and illiteracy from the region after investing in education, health and other infrastructures sectors. President Bhandari stressed on lessening the impact of climate change as it was seen as a common challenge in the region. She said that all should prepare environment conducive to handover a green earth to the next generation. On another note, she called for a focus on ending violence against women and empowering women representation in all sectors. Also present on the occasion were, Vice President Nanda Bahadur Pun, Prime Minister KP Sharma Oli among other VVIPs.